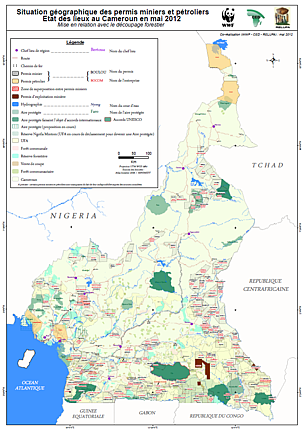 In 2011, WWF produced a map of the protected areas of Cameroon at the request of the government. Simultaneously, observations had been made by conservation groups that mining permits were being granted inside of Cameroon’s protected areas, though the origin and credibility of the data was unclear. Also in 2011, several mining companies presented their credentials to the conservators of the Campo Ma’an and Nki National Parks to inform them that they would begin mining exploration activities inside these protected areas. This propelled WWF, CED, and RELUFA to make an official request to the Ministry of Mines in Cameroon for all valid mining permits. 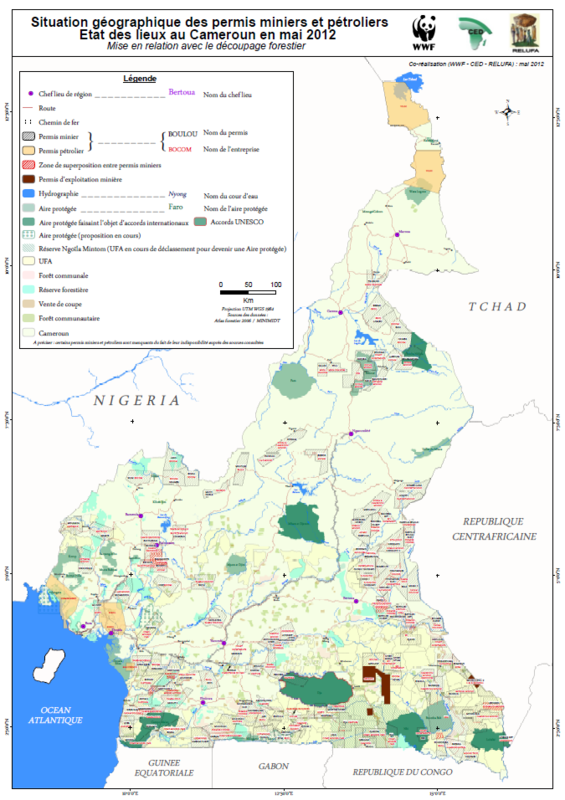 Using official data only on mining permits granted or renewed during the period spanning 2009-2011, the authors and GIS experts produced a mining map of Cameroon which is the basis of this paper. A limited number of oil permits were also made available to the researchers. The authors are aware of the existence of further mining and oil permits that do not appear on the map as the official data has not been made available. The report reveals that there currently exists 30 mining exploration permits overlapping 12 protected areas, and dozens more are in the immediate vicinity of protected areas, with a high potential for conflicting with the government’s conservation objectives. In addition, petroleum permits have been granted in an additional four protected areas. Under Cameroon law these overlaps are illegal. Whilst it is clear that Cameroon and indeed the Congo Basin is rich in minerals, and these minerals need to be extracted in order to deliver economic growth, such overlapping conflicts do not project a smooth path towards economic development. 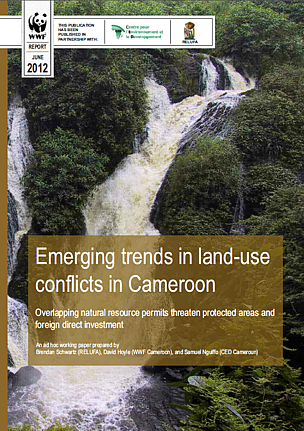 The report proposes that, worse than this, such land-use conflicts could lead to large compensation payouts, potentially tarnish the reputation of Cameroon in terms of conservation leadership in the Congo basin and damage the country’s Doing Business ranking. The report recommends that granting of future permits be suspended until a clear process is implemented to avoid future land-use conflicts. Finally, the report proposes that portions of mining permits overlapping already existing land rights be “cut” (re-delineated). 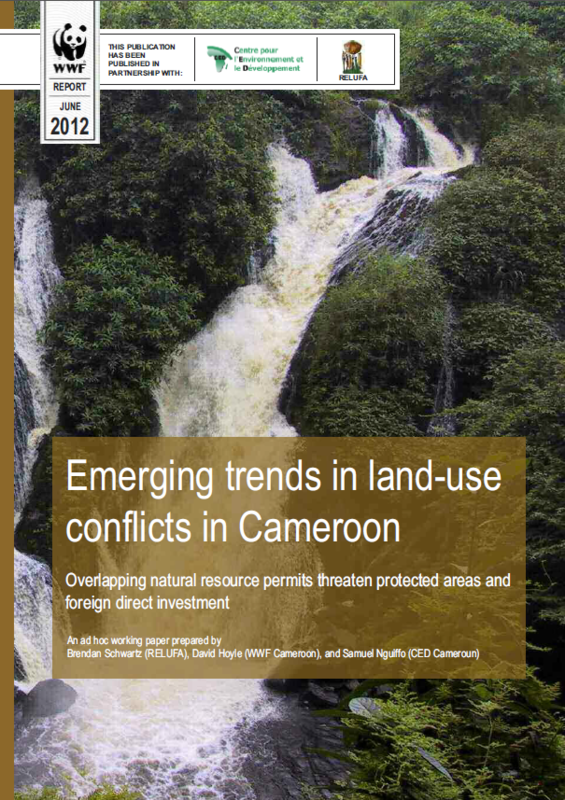 Emerging trends in land-use conflicts in Cameroon. Situation géographique des permis miniers et pétroliers. Etat des lieux au Cameroun en mai 2012.